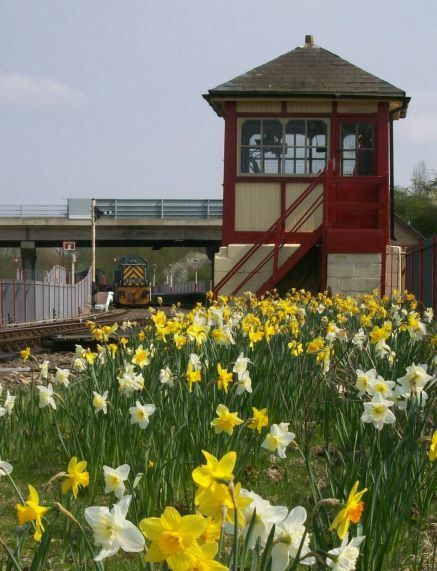 Orton Mere Station is an ideal point to either join the train or stop off at whilst travelling. It has an adjacent free car park for visitors. Within easy walking distance are lakes and the River Nene, which are ideal for a gentle stroll or for taking photos of the local bird population. Some Saturdays & Sundays you will also see model radio controlled boats in action on Osier Lake. Less than five minutes walk takes you to a local sculpture park and rowing lake. The station itself has two platforms with most services departing from platform one unless there are special events taking place. It’s open every day at weekends when passenger services are running and serves a variety of cold snacks and hot or cold drinks. The passing loop is often used by work-trains at weekends and a variety of freight wagons can sometimes be seen behind the works services. To the east of the station is Longville Junction and the Fletton branch, this is the railways link to the main national railway network. Visiting locomotives can be photographed as they often pause at the station before proceeding on to Wansford. Orton Mere forms part of Nene Park, a manmade country park developed in the early 1970's. the nearby lakes made from exhausted gravel pits, which through landscaping over a period of time, were flooded from the nearby River Nene, sympathetic planting of trees and shrubs, many native to the area, creating wildlife havens which can be explored by the walkways and cycle paths extending eastwards towards Peterborough City Centre and westwards back towards Wansford. The Railway Station and platforms were originally built by the Peterborough Railway Society Volunteers and has its own signal box on-site, the extended line from this point joins the railway to the mainline and provides a vital link for visiting locomotives who are able to travel the main line rails. This link - known as the Fletton Loop - takes a scenic path through one of the older parts of Peterborough - from where you can see the home of Hotpoint - watch out for special trips through the year where we take Helga (our Swedish Railcar) along this often unseen stretch of the line. Orton Mere also provides the ideal entrance to the Woodston Reach walkways - an area purchased from British Sugar, once the settling ponds for the sugar beets.